Dart Intake Manifold - BBC Tunnel Ram UNKNOWN - Dezod Motorsports Inc - Home of the automotive performance enthusiast since 2002. 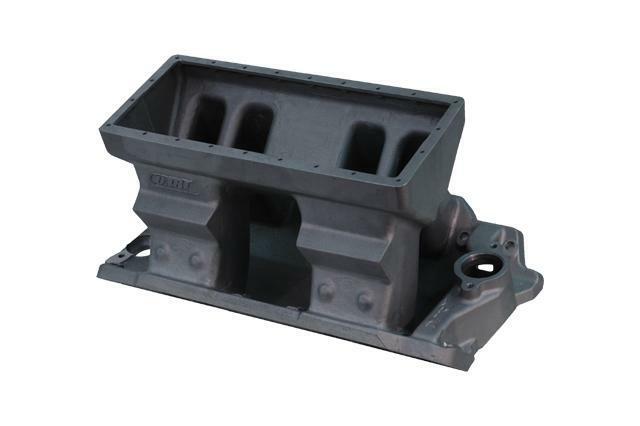 The performance of a custom-built sheet metal intake for the price of a cast manifold! Curved runners meet the cylinder head ports at the correct angle to reduce turbulence in the transition. Tapered “funnel ram” runners maximize intake charge velocity for more complete cylinder filling. Interchangeable top plates are available for inline carburetors, sideways carburetors, and fuel injection. In addition, the fuel injector housing is cast directly into the manifold. Tall-deck manifolds are designed to use standard length distributor (small cap required). Overall height is 9.75”. Short-deck and tall-deck versions available.